Check out this great article in the NEHJ (the full, two-page article is in the PDF link below, or check the whole magazine out at http://digital.hockeyjournal.com/nxtbooks/seamans/nehj_201412/index.php#/56). Every winter, as a hockey player growing up in Marblehead in the 1980s, David Santeusanio made a weekend visit to St. Lambert, Quebec, as part of an annual exchange. His lack of French led to several days of pointing at the meals he wanted. “Not much better now,” the 41-year-old said with a laugh about his French. Santeusanio’s linguistic skills may not have changed. But as vice president of the Marblehead Youth Hockey Association, Santeusanio is experiencing a longtime program as a parent instead of a participant. This year marks the 50th anniversary of the youth hockey exchange between Marblehead and St. Lambert, a Montreal suburb just south across the St. Lawrence River. Its organizers believe it is the oldest such exchange in North America. 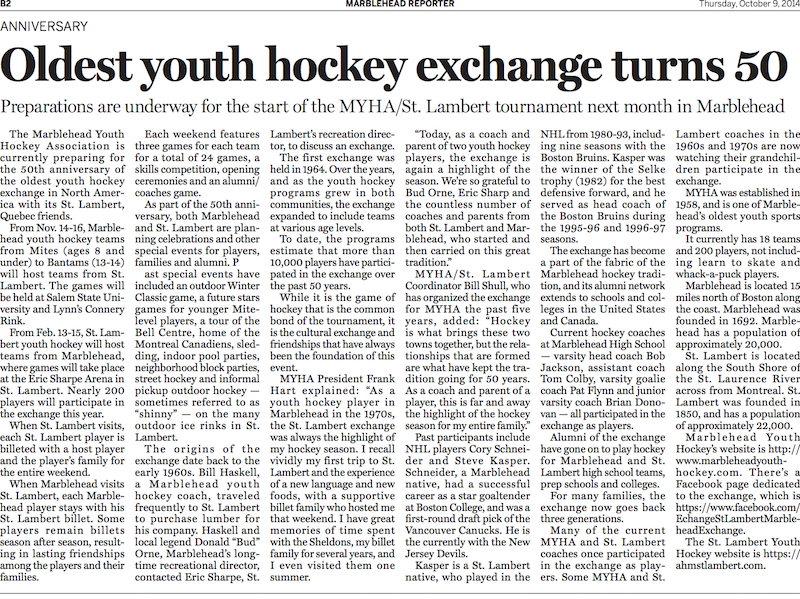 In November, mites, squirts, peewees, and bantams from St. Lambert will arrive in Marblehead. They will stay for a weekend to play games at Salem State University, participate in off-ice activities, and live with Marblehead families. In February, the Marblehead players will do the same at St. Lambert’s Eric Sharp Arena. Approximately 200 players will take part in the exchange, including Santeusanio’s 12-year-old son, Peter, and 9-year-old daughter, Kate. Previous participants include Devils goalie Cory Schneider and former Bruins coach Steve Kasper. The exchange started in 1964. Bill Haskell, a Marblehead youth hockey coach, regularly traveled to St. Lambert to purchase lumber for his business. After casual conversations, Haskell and his Canadian counterparts decided to launch the exchange for their players. Several generations have since participated in the program. It's a great time to be a sports fan in New England as the Sox have captured another World Championship, The Pats are pounding opponents towards an undefeated season, and the Bruins and Celtics both bring hopes of a promising new year. 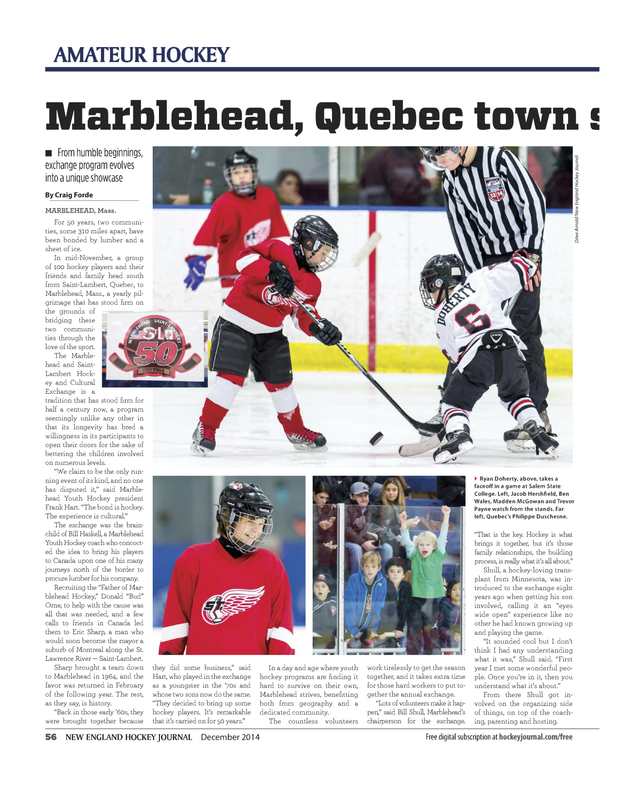 It is also a great time of year to be a young hockey player in Marblehead as the town hosts its annual tournament with the city of St Lambert in Quebec. The 43rd Annual Marblehead St Lambert Cultural Exchange and Hockey Tournament will kick off this weekend with games and events at Salem State College throughout the weekend. Over 100 families from St Lambert will travel to Marblehead and will be hosted to a weekend full of fun activites, camaraderie and lots of hockey. As soon as the Marblehead youth hockey players lace up their skates for the first time and head back to school in the fall, they wait with anticipation for their new buddies and old to arrive from Canada. Close to 10,000 players and their families have been involved in this event over the years which has featured competitive hockey but also lifelong learning experiences for the young participants of the exchange. While it is the game of hockey that is the common bond of the tournament, it is the cultural exchange which has always been the foundation of this event. The Marblehead St-Lambert exchange is the longest running exchange of its kind in North America and it has been entertaining families on both sides of the border since its inception back in 1964 when Donald "Bud" Orne, recreation director of Marblehead, and Eric Sharp, recreation director from St Lambert, decided to get their teams together for a "friendly" competition. The following year started the player exchange which has continued every year to this date. Orne remembered “We drove up in two buses during February of 1965 and they came down around Easter. They treated us very well and we kept the exchange going." The exchange has always been competitive but grounded in fun. Some years the teams were even mixed up for the sport of it. Orne continued, "We made it a rule that everyone played regardless of their ability. I still hear from some of the poorer players and how it meant so much to them to be a part of something." Bud Orne and Eric Sharp created an everlasting legacy for the kids of their respective towns that has stood the test of time and shows no end in sight. Bud Orne passed away in 2005 and Marblehead Youth Hockey honored his lifetime achievements for the kids of his town by wearing "BUD" patches on their hockey jerseys for their season. Most continue to wear the patch in Bud's honor. This years opening ceremonies will honor the past presidents of Marblehead Youth Hockey for their hard work and commitment in keeping the exchange going over the years. Bud inspired the tradition but was followed by many other dedicated individuals including Jack Reiley, Phil Sweeny, Norm Cressy, Secret Woodfin, Ed Clifford, Wayne Attridge, Dave Hamilton, Rob Cohn, Tom Kennedy, Sean Dempsey and current MYHA president, Bill Hughes. The president position has many triumphs but lots of tribulations as it is often a second full time job for many who take the helm. Jack Reiley had huge shoes to fill as he remembered “Bud” running the organization out of his Pleasant Street Barber Shop for many years with most of the big decision being made during a haircut or two. Reiley recalls his fondest memory of his tenure was being called out to drop the opening puck in St Lambert. “I was honored to be called out to represent the town of Marblehead up in Canada and still remember the event like it was yesterday”. As the Marblehead Hockey program grew in the 1970s so did the annual exchange. Phil Sweeny drove the ship as the kids headed up to St Lambert in buses during the early seventies while his boys skated in the program. Sweeny has loads of great memories from his years of running the exchange and many can be heard over a pint of Guinness at his local restaurant, Sweeny’s Retreat. Norm Cressy took the reigns of the program in 1976 as his son Eric and all of his friends grew into the exchange. Norm and Eric now have the honor of watching Eric’s son Reed Cressy take part in the tradition for the first time with his Squirt 2 hockey team. Norm sums up his experience quite simply with “Great times, great friends and great memories”. His son Eric adds, “ 30 years ago I went to St Lambert with Rob Haley, Anthony DelVento and Chuck Hennigar. Now they are coaching my son and all of our boys will be going to the tournament together. It’s a great tradition”. Reed Cressy looks ahead to the weekend with, “ I can’t wait for the weekend. My friends tell me it is AWESOME!” Wayne Attridge was appointed president in the late 1980s as he sons participated in the exchange. Attridge was inducted into the Friends of Marblehead Hockey Hall of Fame this year for his efforts in restoring the pride and strength of the MYHA program. Tom Kennedy, president from 2002-2003 looks back fondly on his time “It was a great two years, following in the foot steps of Rob Cohn and handing over the reigns to Sean Dempsey. We had many challenges as the organization was growing: finding ice time, finding coaches and keeping it fun for the kids. I Couldn't have done it without the help of the hockey board and all the volunteers that give up their time to let the kids have fun and play a sport that they love.” Kennedy’s son, Cam, will take to the ice for the Mite 1s this year and is looking forward to showing his new buddy around the town of Marblehead. Kennedy will be joined on the Mite 1 bench this year by head coach Scott Garfield and assistant coach Jeff Dinsmore who both played hockey in Marblehead from the Mite level to the High School level under Bob Roland. Both Garfield’s son, Jacob, and Dinsmore’s son, Robbie, will skate opposite their new St Lambert buddies next weekend. Jeff participated in the exchange with Cressy in the 70s and is happy to see his son follow in his footstep.” Growing up the St. Lambert exchange weekend was always something to look forward to. I have fond memories of the exchange, as much for the competitive hockey as for the camaraderie and friendships made with the Canadian kids. I am happy that Robbie will have the chance to participate this year - it is a memorable experience." Robbie states is quite simply "It's going to be fun - I can't wait!" Today Marblehead's Youth Hockey program is booming with greater participation than ever before. Marblehead currently has fourteen teams competing in the Valley League, including an all girls team called the Hollyhocks. Currently, the top two teams at each level participate in the exchange due to ice time and player participation from St-Lambert. Each Marblehead player is matched up with a Canadian buddy through a billeting process and is hosted by the local family for the weekend. In the early years, players from both sides were put on buses and shipped across the border with only their bags and a couple of coaches. The exchange has now become a family event and Marblehead can expect close to 250 visitors of families and friends for the long Veteran's Day weekend. best stories. Marblehead started its Youth Hockey program in 1959 in the old bowling alley of the town's YMCA. There was very little ice time and the team relied mostly on the ponds of Marblehead freezing in the winter. Ed Tufts, a proud coach from the early years, remembers "As soon as winter set in and word got out that the ice was smooth, the local boys would take control of the best part of the ice and set up the goals. There was no age limit and from time to time, the young speedsters would gaze in awe as one of the old-timers would perform magic with his stick". Marblehead sports legend, Trem Robarts, recruited the boys from Black Joe's, Bobby's Pond and the Cliftonites from Weare's Pond and set them up compete with one another. Trem also solicited Bud Orne's assistance as he was working at the town's YMCA. Luckily the Bowling alley at the YMCA was closing so Bud and the team covered the floors with plywood, waxed the floors and created an indoor practice facility for stick handling and shooting. Ed Colby and Bud Orne were the coaches in the early days. For the next few years, Bobby's Pond became the focal point as Larz Anderson, longtime friend of Marblehead Hockey, provided the lumber and built boards at the pond. As the program blossomed in the early 60s, practices shifted to the Eastern bus Garage in Saugus where players has to dodge steel girders as they passed the puck around. Games were played at Lynn Arena, Gordon College and eventually to Salem State College when Rockett Arena was built. If you frequent the rinks or the local establishments around Marblehead you can often hear lively discussions about people’s memories of past exchanges. Sometimes it is teenagers but mostly it is the fathers and grandfathers who participated in the early years of the exchange. Remarkably, it is the memories and stories of events off the ice which have endured throughout the years and not the hockey itself. So, while the competitiveness of hockey and winning might seem important today, it will be the experiences with the players and their buddies off the ice which will endure for many years to come. 14 Year old Bantam 1 player, Tyler Gelineau, has a bitter sweet feeling going into this weekends exchange as it will be his last of eight consecutive years of his participation. He reflects the sentiments of most when he offers. "The Marblehead - St. Lambert Hockey Tournament and Cultural Exchange experience has many stories, games and memories that I will remember and tell throughout my life” Gelineau continues “The rivalry between the Canadians and Marblehead has been going on for 43 years and it still continues today through many generations, as fathers who played in this tournament are now coaching and watching their kids play the same tournament bringing back their old memories. I treasure my eight years and look forward to seeing my close Canadian buddies again and again, living at each others houses, sharing food, lifestyles, language and being part of each others family”. Gelineau and his longtime St.-Lambert buddy Philippe Stone-Huppertz will carry their countries flags for the opening ceremonies and will be honored for their commitments to the exchange over the years. Hockey grandmother of Squirt 2 and PeeWee 3 skaters, Jed and Wilson Lautner, and accomplished Broadway performer, Bette Lautner, will perform the US National Anthem during the opening ceremonies. Lautner’s music student, Liz Jancsy will sing the Canadian Anthem. Liz’s brother, Payton, plays for the Squirt 1s which her dad, Pat, coaches the team. Lautner will close the ceremonies with her rendition of God Bless America in observance of Memorial Day. The Marblehead-St-Lambert tradition kicks off at Rockett Arena on the campus of Salem State College this weekend as the hometown Squirt 2s take on their Canadian counterparts at 4:30PM on Friday followed by PeeWee and Bantam Games. Other events planned for Saturday include Opening Ceremonies, a Skills Competition, a DJ driven family skate and pizza party, a mixed coach’s game, 24 tournament games, and many other individual team events. Walking tours of Marblehead with Pam Peterson of the Marblehead Historical Society will also be offered on Saturday for those wishing to share Marblehead’s rich history and heritage with their St Lambert families. All event are free and the public is cordially invited to attend. For more information on schedules and events visit the Marblehead Youth Hockey website at www.marbleheadyouthhockey.com/.